At Coolsmiles, our goal is to provide you with highly personalized care with a high level of clinical excellence without having you wait. I think you will agree that this is not an easy task. The key is our daily schedule. We intentionally do not over schedule our patients so that we may run on time. We have been told, barring any unusual emergencies, we do pretty well. For us pretty well is not good enough. We pride ourselves on our patient services and we think we have a way to make it even better. 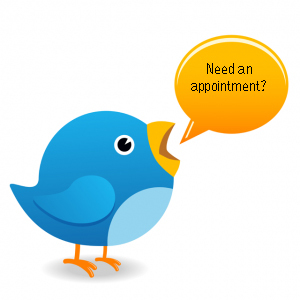 As you know, we ask you to schedule your next appointment at each visit. This insures you the best selection of available days and times. However, we know that unexpected events happen and occasionally a child is ill and an appointment is broken or cancelled at the last minute. This can result in some limitations of availability when trying to reschedule. Until now, we have found little use for Twitter in our practice. We think it can be useful for us to announce last minute cancellations to those with the flexibility to come in that day. Think of it as a traditional cancellation list, where you would ask us to call you if an appointment suddenly opens up at the last minute. Starting Monday we will “CoolTweet” any last minute availability and we will fill them on a first call basis. Remember, you need to call and make sure the spot is still available.